Notification issued 9/9/16 at 12:00 PM. Five F-15E Strike Eagle aircraft will conduct a flyover tomorrow, September 10, starting at 3:00 PM. 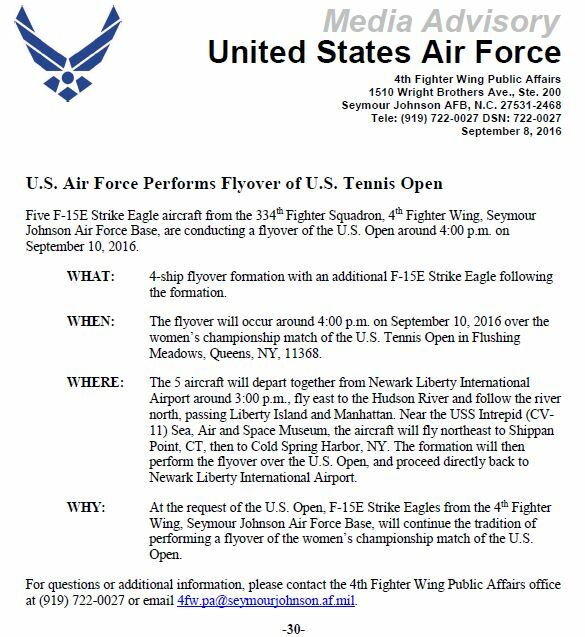 The aircraft will fly from Newark Airport along the Hudson River and continue northeast to then perform a flyover over the U.S. Open at Arthur Ashe Stadium. For more information: http://imgur.com/g5SNuTJ.jpg.